"Monroe County Executive Maggie Brooks today hosted a ribbon cutting ceremony and announced the official opening of the Monroe County Public Safety Laboratory, or Crime Lab. The new facility delivers on the County Executive’s commitment to ensuring that law enforcement and public safety professionals have the best possible resources available to prevent and solve crimes. The Crime Lab is a regional resource that provides forensic analysis services to law enforcement and public safety agencies in Monroe, Genesee, Livingston, Ontario, Seneca, Wayne, Wyoming, and Yates Counties. Established in 1961, the Crime Lab has spent the past forty-eight years on the fifth floor of the Monroe County Public Safety Building. The lack of space at the outdated laboratory, coupled with the need for a complete replacement of building systems, prompted the need for a new facility. 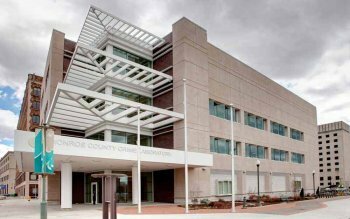 In 2005, County Executive Brooks formed the Crime Lab Task Force to assess the need to expand and modernize the facility and determine potential construction sites and cost estimates. The Task Force gave its recommendations to LaBella Associates, who then developed the Master Plan. The new Crime Lab is four stories tall and 45,000 square feet in size, allowing for future lab expansions. It is located at 85 West Broad Street on the southeast corner of Plymouth Avenue and Broad Street in the City of Rochester. The building’s architecture and engineering fully complies with the County’s Green Building Policy by incorporating sustainable design principles. As a result, the County pursued and has been awarded LEED Platinum Certification from the U.S. Green Building Council, making it the first Platinum-rated “green” government building in Monroe County. Construction of the Crime Lab employed a significant union labor workforce thanks to a Project Labor Agreement signed by the County and local labor unions. County Executive Brooks also thanked the Monroe County Legislature who voted unanimously to fund the capital project through state, federal and local dollars. Over $6.6 million dollars in federal funding for the Crime Lab was provided by Senator Charles Schumer and former Senator Hillary Clinton as well as former Congressmen Tom Reynolds, Randy Kuhl, and Jim Walsh, and current Congresswoman Louise Slaughter."